Room temperature cream cheese. Mix in grind up oreo cookies, mix well using your clean hands. Roll into small or medium size balls. Refrigerator for 15 to 20 minutes. Gentle melt chocolate chips. 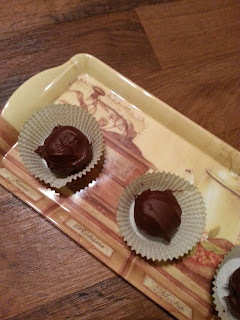 Dip balls in melted chocolate. Place on wax paper on rimmed sheet pan and refrigerate for 1 hour or until firm. I'm subscribing to you! And thanks for the recipe!